What is Clean My Chrome 1.0.1? 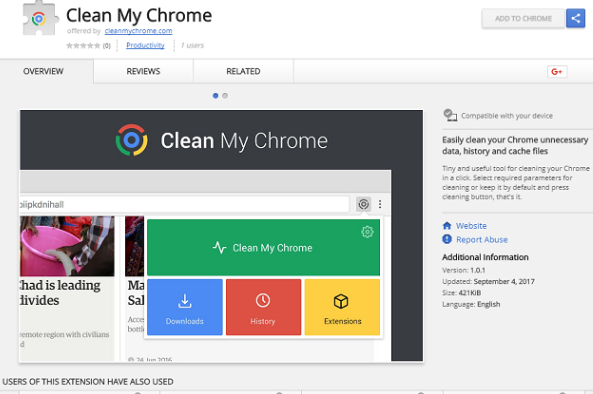 Clean My Chrome 1.0.1 is a malicious Google Chrome extension you might find illegally installed on your browser. It will not act beneficially, so we see the only possible outcome – the full Clean My Chrome 1.0.1 removal. There is no point in keeping this extension installed on the system because it is basically useless and might only cause a lot of problems to those users who decide to keep it installed on their PCs. If you agree with us that the suspicious extension should not stay on your system, you should go to remove Clean My Chrome 1.0.1 immediately after you read this article. We are sure that you will change your opinion about it after reading this article. In other words, you will finally realize that it is not what it seems to be and decide to uninstall Clean My Chrome 1.0.1 as soon as possible, we are sure. What does Clean My Chrome 1.0.1 do? Clean My Chrome 1.0.1 is distributed as a trustworthy application, but it is far from trustworthy software in reality. It is more likely that it is useless software that has been released by malicious software developers to promote certain pages and collect information about users seeking to sell it. Yes, you are right – Clean My Chrome 1.0.1 might start showing irritating advertisements on your screen one day. Most probably, you will mainly see pop-ups. Despite the fact that they look harmless, the appearance of these pop-ups might be the main reason malicious software manages to successfully enter your system because they can redirect to corrupted pages full of malicious software. You should also hurry to delete Clean My Chrome 1.0.1 from your Google Chrome browser because it might start collecting information about you. We cannot promise that it will not be interested in any personal details about you. Where does Clean My Chrome 1.0.1 come from? You could have downloaded Clean My Chrome 1.0.1 and installed on your web browser yourself, but we are still sure that the chances are higher that it has entered your system illegally. Such dubious browser extensions as Clean My Chrome 1.0.1 use a variety of different methods to enter users’ computers unnoticed; however, it is very likely that one of these methods is used more commonly than others. This method is called bundling. Generally speaking, it is very likely that the undesirable browser extension has entered your system in a software bundle. If the reason you have it installed on your system is completely different, you still need to implement the Clean My Chrome 1.0.1 removal today. How do I remove Clean My Chrome 1.0.1? You need to delete Clean My Chrome 1.0.1 as soon as possible because it is an untrustworthy extension. You can do this either manually or automatically – choose the method you like; however, we have one piece of advice for you – go to delete Clean My Chrome 1.0.1 from your browser automatically if you are one of those inexperienced users.